OPEN MIC w RoJo @ Twin Oaks Roadhouse. Share YOUR music, poetry or comedy. 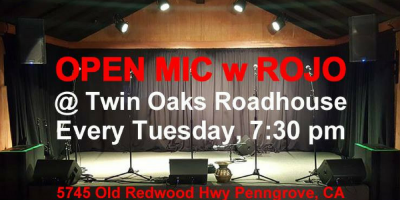 Bring your music, comedy and spoken word to the HopMonk’s Twin Oaks Open Mic with RoJo, every Tuesday night. Best small venue sound system in the county!